I made the decision to give it a try but had to delay the review until today as the application crashed on several devices that I tried to run it on. Googled fixed the issue recently which gave me the opportunity to give it a try. Is Google Podcast the start of something beautiful as Tristan Greene over at TNW thinks? Let's find out. Google Podcasts displays a list of top and trending podcasts on start, and top podcasts of categories such as comedy, news & politics, or religion & spirituality when you scroll down. A tap on a podcast displays a short description and available episodes. You can play any right away with a tap on the play button. The first issue that you may run into is that you cannot subscribe to any podcasts if you don't turn on the Web & app activity. 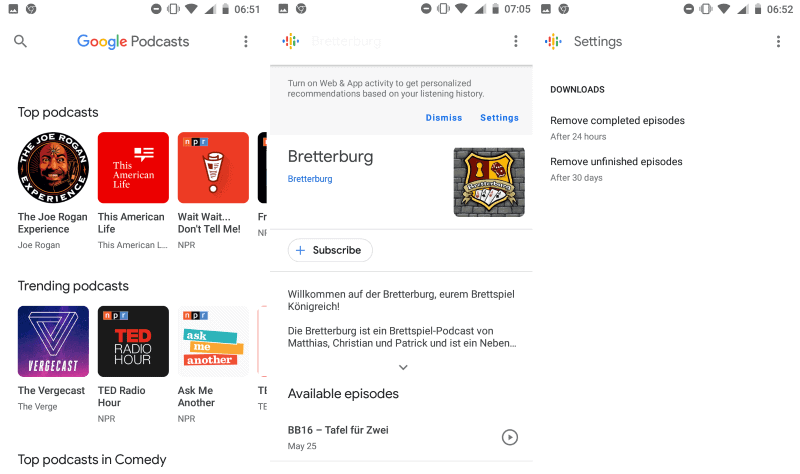 Google Podcasts states that it is used to give "personalized recommendations based on your listening history". While Google Podcasts does display a "dismiss" option, doing so won't subscribe you to the podcasts and tapping on the subscribe button again displays the same permission notification. So, if you don't give Google permission to save the activity on Google sites and apps, including searches, you cannot use one of the essential features of any podcasting application: subscribing to podcasts. While you can still play podcasts directly, you'd have to check any podcast you are interested in regularly to find out if new episodes have been published. You are in for another disappointment when you check the available options and settings. The settings page lists just two options right now: the two define when episodes get deleted. That's it; no option to change the download location for podcasts, and no option to define auto-downloading behavior. The rest of the application is as bare-bones as its settings. Google Podcasts does not support playlists or custom podcast URLs. If a podcast is not included in Google's directory, you cannot add it to the application. Playback quality is good and Google did implement some useful features such as changing the playback speed or skipping forward or back. When you compare Google Podcasts to popular podcasting apps for Android such as Pocket Casts (paid) or Podcast Addict you will notice that these offer better functionality. Google Podcasts could get there eventually but Google would have to improve the app across the board. As it stands right now, there is no reason to use Google Podcast as you find plenty of better alternatives on Google Play. Now You: What is your take on Google Podcast? It sounds more like a proof-of-concept than an actual product. Personally, I use DoggCatcher for podcasts, and am happy with it. The app is a stub for the already existing functionality in the Google app. What did you expect? Google does that a lot. I understand that they want to test out things. Thing is people get hooked on it and start liking the functionality. However, as soon as they start pushing advertisements in, they tend to lose core features and frankly other competitors emerge. Eg Google reader – I still cannot believe that Google killed it as well as Picasa. I tried Google Podcasts and found it laughable. Any 4 star podcast app on Google play does 10 times more than this app. I use a FOSS podcast app called AntennaPod. Works great and is actively updated. Another Google grab to intrude upon and index our inner most thoughts and sentiment. The less I use Google product, the more I feel better about the internet, myself, and the world in general. PS: I use Winamp version 563; that version being the last great Winamp. Though foobar2000 portable is my default for playing music, Winamp is used many times a week for many task. All aspects of it still work 100% perfect for everything — especially podcasting! Winamp ver 563 is far superior to iTunes for podcasting because it doesn’t blacklist auto updates to certain podcast it deems not in line with its Apple’s political ideology. Winamp is 100% neutral to your taste so doesn’t censor your reach like google and apple do. As always with Winamp, add the below entries to your host file so Winamp never sucessfully calls ‘home’; whoever owns home at the moment).